Afrojack | Do You Hear The Music? Sweet home Chicago! What can I say except the 20th Anniversary of Lollapalooza far exceeded any experience I could have ever imagined. More photos will be coming soon but wow what a good time and so many great bands/artists performing. If you wanted to discover new music, hear some great bands of the past 20+ years or just come and hang out, Grant Park was the place to be. Day One of Lolla: Ryan Leslie, Tab The Band, Young The Giant, Naked & Famous, Delta Spirit, Foster The People, White Lies, Two Door Cinema Club, Skrillex, Afrojack, Muse, Coldplay and late night CULTS show at the Hard Rock. Day Two of Lolla: GROUPLOVE, Walk The Moon, Maps & Atlases, Friendly Fires, Black Lips, Big Audio Dynamite, Joachim Garraud, Local Natives, My Morning Jacket, Eminem, My Morning Jacket. Night show: Skylar Grey, Mia Moretti & Caitlin Moe, Black Lips. Next Big Thing: Young The Giant, these guys drew over 20,000 people at 1 p.m. and Foster The People, man in six months these guys are doing it! Best Festival Eats: the guy who brought in Garrett Popcorn in with him. Thanks for sharing! I think this should be the theme song for this weekend in Las Vegas. Going to be exactly that, pandemonium. It’s a great day as a good friend of mine and fellow music lover, Angela (@IMWITHTHEDEEJAY), becomes the first guest blogger on Do You Hear The Music and shares her first Coachella experience in words and video. Angela has one of the coolest blogs I’ve come across and always has fun, interesting and inspiring posts as well as the latest and greatest from DJ Vice. Check out the below and then visit her blog and follow her on Twitter. I’m no stranger to packed crowds, pounding beats and rhythmic drum patterns and quite candidly house music, nightlife and large crowds make me feel at home; so much so it’s why I started my blog, rightfully titled: IMWITHTHEDEEJAY. No further explanation needed. Going to Coachella for the first time alongside DJ VICE proved to me that this festival truly has something for everyone. I was quite surprised just how many DJ sets were scheduled during the weekend line-up and thus spent a lot of time checking them out. What impressed me the most about Coachella was the variety of music ranging from indie, house and dub step to R&B and hip-hop. I learned about some new artists, such as Leftfield, while also appreciating artists I was already familiar with even more after hearing their songs live combined with their stage presence (Chromeo, The Strokes, Cut Copy). Here is a short video I put together to share some of the highlights on my experience and exactly why I plan to go back every year. Enjoy. worst moment : the moment I felt the urge to pee & knew I was going to hold it ALL night! Yuck on portable bathrooms. best fashion piece I saw : crochet white fringe vest with white glowsticks tied to each piece. best overall: the great choice in music – you can’t even manage to hear everyone you would like to because there are so many stages & performances. worst overall: DUST = allergies, scratchy eyes, watery nose and a layer of film all over you. Don’t bring next year: Any “professional” DSLR camera – they won’t let you in with it. Pack next year : bandana & anything glow in the dark! 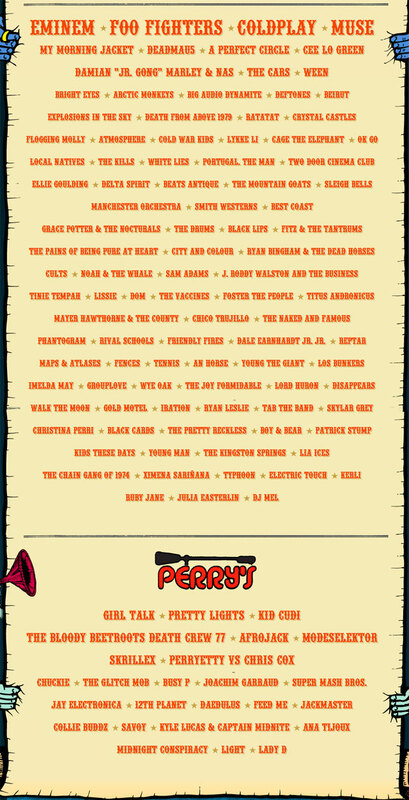 Ok so now the planning can officially begin getting underway as the 2011 Coachella line-up has been announced. 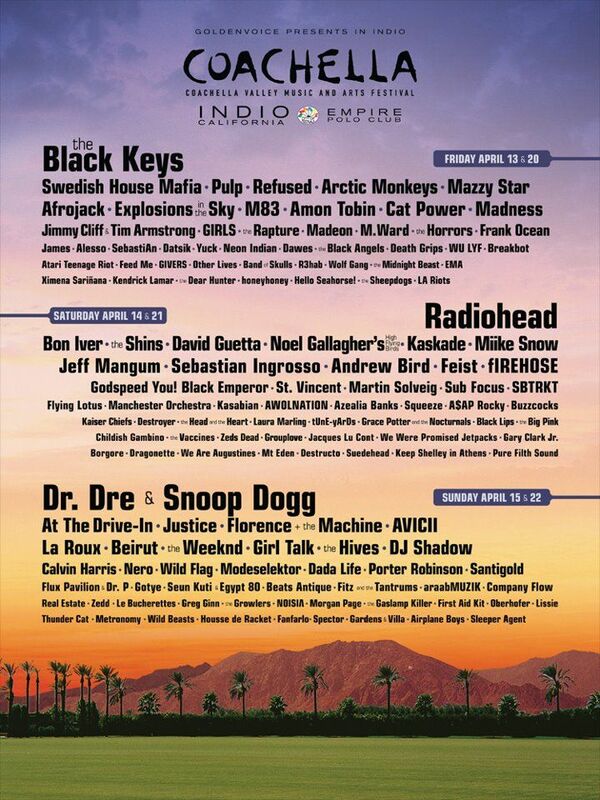 I am so stoked about this line-up and definitely finding my way to Indio this spring. At first glance, Day One is top priority. As much as a fan I am of Kings of Leon, The Black Keys, Lauren Hill, Cut Copy, Brandon Flowers and all the other top billing acts, I’m more jacked about Black Joe Lewis & The Honeybears, Here We Go Magic, Klaxons, !! !, The Drums, Afrojack, Ozomatli, The Morning Benders and Ariel Pink’s Haunted Graffiti to name a few. Day Two is going to be a dance party bonanza with Steve Angello, Empire of the Sun, Paul van Dyk, Fedde Le Grand, Laidback Luke, Joachim Garraud, Chuckie and more plus, Raphael Saadiq, Two Door Cinema Club, Foals, the Kills, Mariachi El Bronx plus Arcade Fire, Mumford & Sons and so much more! Day Three has a ton more great artists but I am not as high on it as Days 1 & 2. The return of the Strokes, The National, Duran Duran, Duck Sauce, Eliza Doolittle, Tinie Tempah, and Ben Harper’s Fistful of Mercy should all be insane performances. All I can say is WOW and while some may start chiming in saying this isn’t the best Coachella line-up in the 12 years I would argue that when we recap the festival later this spring it will go down in the record books as featuring one of the finest collections of music we have ever seen over the course of three days. Three-day weekend passes, along with camping passes for Coachella go on sale Friday, Jan. 21 at 10:00 AM (PT) through Ticketmaster.com, by phone at (800) 745-3000 and at http://www.coachella.com. Three-day weekend passes are $269.00, plus surcharges, and camping passes are $75.00. More details on layaway, camping options and up-to-the minute information, can be found at http://www.coachella.com. Tags: 2011, A-Trak, Afrojack, Alf Alpha, Andy C, Angus and Julia Stone, Animal Collective, Arcade Fire, Ariel Pink's Haunted Graffiti, Axwell Beardyman, Best Coast, Big Audio Dynamite, Black Joe Lewis & the Honeybears, Bloody Beetroots Death Crew 77, Bomba Estereo, Boys Noize, Brandon Flowers, Brandt Brauer Frick, Breakage, Bright Eyes, Broken Social Scene Cage the Elephant, Caifanes, Caspa, Cee Lo Green, Chromeo, Chuckie, City and Colour, Clare Maguire, Coachella, Cold Cave, Cold War Kids, Crystal Castles, CSS, Cults, Cut Copy Daedelus, Death From Above 1979, Delorean, Delta Sprirt, DJ Hype, DJ Kentaro, DJ Marky, DJ Zinc, Duck Sauce, Duran Duran EE, Elbow, Electric Touch, Eliza Doolittle, Ellie Goulding, Emicida, Empire of the Sun, Erick Morillo, Erykah Badu, Excision Fat Freddy's Drop, Fedde Le Grand, Fistful of Mercy, Flogging Molly, Foals, Foster the People, Francis and the Lights, Freelance Whales, fun. G.Q., Gayngs, Glasser, Gogol Bordello, Good Old War, Gord Downie, Goth Trad, Green Velvet, Gypsy and the Cat HEALTH, Here We Go Magic, High Contrast, Hurts Interpol Jack Beats, Jack's Mannequin, Jakes, Jenny and Johnny, Jimmy Eat World, Joachim Garraud, Joy Orbison Kanye West, Kele, Kings of Leon, Klaxons, Kode9, Kyle Hall Laidback Luke, Leftfield, Lightning Bolt, Lil' B, Lorn, Los Bunkers Magnetic Man, Mariachi El Bronx, Marina and the Diamonds, Mary Anne Hobbs, MEN, Menomena, Monarchy, Mount Kimbie, Moving Units, Ms. Lauryn Hill, Mumford & Sons Nas & Damian Marley, Neon Trees, New Pants, Nosaj Thing OFF!, OFWGKTA, Omar Rodriguez Lopez, One Day as a Lion, Ozomatli Paul van Dyk, Phantogram, Phosphorescent, PJ Harvey, Plan B, Ramadanman, Raphael Saadiq, Ras G, Ratatat, Riva Starr, Robyn, Roska, Rye Rye Sander Kleinenberg, Sasha, SBTRKT, Scala & Kolacny Bros., Scissor Sisters, She Wants Revenge, Shpongle, Skrillex, Sleigh Bells, Steve Angello, Sven Vath Take, Tame Impala, Terror Danjah, Thao and the Get Down Stay Down, The Aquabats, The Black Keys, The Chemical Brothers, The Drums, The Felice Brothers, The Henry Clay People, The Joy Formidable, The Kills, The London Suede, The Love Language, The Morning Benders, the National, The New Pornographers, The Pains of Being Pure at Heart, The Presets, The Radio Dept., The Rural Alberta Advantage, The Strokes, The Swell Season, The Tallest Man on Earth, The Twelves, Thunderball, Tinie Tempah, Titus Andronicus, Tokimonsta, Trampled by Turtles, Trentemoller, Twin Shadow, Two Door Cinema Club Warpaint, Wire, Wiz Khalifa Yacht, Yelle Zed Bias. These are in no particular order (except for the first one with good reason) because there is so much good music and moments to capture and look back on in 2010. I know I have forgotten some and welcome your additions but here are some are of my favorites from the past 365 days. Temper Trap – the Australians blew up in the US in 2010, headlining tours, “Sweet Disposition” being remixed into one of the best electronic songs, “Fader” taking off on the charts, etc. Pepper at HRH – always guarantee a good time when going to see Pepper Live and once again they rocked the Hard Rock Hotel in Vegas poolside to a HUGE crowd. Taio Cruz – “Dynamite” – this song is club gold. The reactions when this song is played is right up there with “I’ve Got a Feeling,” “Just Dance,” “Since You’ve Been Gone” and the likes where people go absolutely insane for it. Cee Lo – what can’t he do? Late Night with Jimmy Fallon because of The Roots as the house band – did you see the performances? Why No Electronic Music In Rolling Stone’s Top 50 Singles Of 2010? Swedish House Mafia – “One” – arguably the song of the summer and anyone who’s been to a pool party or a nightclub has heard this. The song took off like a wild fire and didn’t get put out. Afrojack – “Take Over Control” ft. Eva Simons – a late bloomer but still one of the hottest dance tracks of the year. Play this song for anyone and I’d be shocked if they don’t start dancing. Deadmau5 – “Sofi Needs A Ladder” – for as much as Rolling Stone has a crush on Deadmau5 and for this song not to be included is a shame. Steve Aoki – “I’m In The House” ft. will.i.am – for as much electro as the music industry has gone in 2010 and how big the Black Eyed Peas are, this would be borderline consideration at least. Those are just a handful of songs that deserve their due but we could go on forever with this and artists who are not being recognized (Yolanda Be Cool & DCup, Roger Sanchez, Alex Gaudino, etc.) for their influence on pop culture. Just because they may not have a song full of lyrics or one incredible line that makes you laugh shouldn’t take away from the sheer talent and popularity. I know not everyone is into electronic music and that’s fine but don’t just dance (no pun intended) with the music throughout the year and then throw it to the curb when it’s time to hand out awards and accolades.